Brian Hillis spent much of his childhood in Taiwan, has served on the mission field in Columbia, and currently resides with his wife, Susan, in Atlanta, GA. Their adoptive journey started in 1995 in the midst of great heartache. They have adopted a total of eight children, and today their family is a testimony of God’s redemption, love, and joy. Brian, when did you find you had a desire to potentially adopt one day? Was it always something you were looking to do? I think adoption was something that both Susan and I would say we always considered an option for us. Our son Johnny struggled with some pretty severe health issues, however, and we felt like his needs made adoption unadvisable. 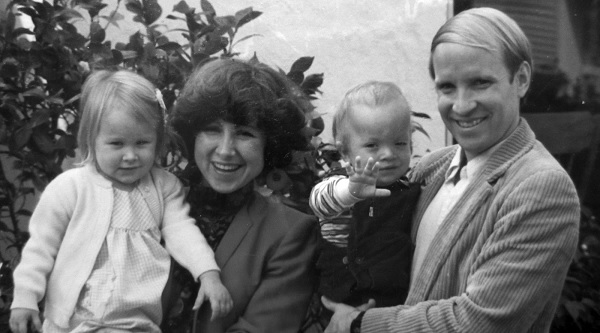 Brian and Susan before adoption, with their children Cristi and Johnny. So, though you had a heart to adopt, you did not foresee actually doing so. Tell me the story of how you came to adopt the first two children, Alex and Anya. One afternoon when Johnny was nine, he was riding his bike and was struck by a car and killed. We were devastated. The day after he died, though, our daughter broached us about the possibility of adoption, and it did not take too many days for that idea to resonate in our hearts. Though we were still in the midst of the grieving process, we were convinced we had a lot of love to give out to other children. We were also aware that we, who had suffered the loss of a child, would be able to relate in a special way to a child who had suffered the loss of their parents. When we first started looking to adopt, we investigated options for adopting a Spanish-speaking child since we had been missionaries in South America and spoke Spanish well. We considered a number of options, but nothing worked out. About six months after we started pursuing adoption, my wife, who works for the Center for Disease Control, received a short video about two children from Russia. The children, a brother and sister, were living in an orphanage, and the little girl needed surgical repair on her legs. The video had been sent to her by a friend in an adoption agency who knew Susan had a medical background. She thought perhaps my wife would be able to identify someone in the US who would be willing to perform the needed surgery. Even though the video was not made or sent to present these children as available for adoption, when we watched the video we both knew immediately that they were to be our children. 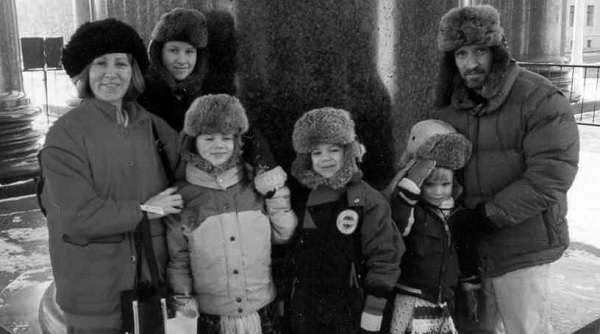 The Hillis family in Russia upon adopting Anya and Alex. How did Alex and Anya respond to being adopted? Most kids are “off the wall” when first adopted. You cannot imagine all the first time experiences they have. Eating all they want, having their own clothes, and flying in an airplane are all totally new experiences. Alex loved to push buttons and spent the first month pushing every button he saw multiple times, including the stewardess call button on the plane. Both children would also hide fruit in their beds at night to be sure they had something to eat in the morning. From what you said, it seems like those early days were times of great joy and great adjustment, that your children loved their new life but also had trouble leaving some of their orphan ways. In those early days, how did they relate to you as their father? Also, can you please describe your heart toward them, especially in the midst of their struggles? Obviously there were huge adjustments. We wanted them to relate to us as their parents, but they had no basis for trust or love for us. We couldn’t even speak their language, and I am sure it was many months before they truly felt like they were a permanent part of our family. On the other hand, I felt like they were my children quite quickly. I saw many things in them that I did not understand or wished I could change, but I came to love and accept them very early in the process, probably long before they came to love and trust me. That was a struggle for me, as I wanted them to be confident in my love but understood that it would take a long time for their love to grow. I also realized they had a number of deep hurts that would take years to heal. While we’re on this track, please describe some things that typify an orphan’s mindset and behavior. What have been some struggles for your children in learning to live as loved sons and daughters? A couple things really stand out as being a part of the orphan mindset. They are very cautious about accepting grace. They will lie rather than admit to a wrong because they are afraid they will lose your love and acceptance. They also have a real struggle planning and thinking about the future. In the orphanage, they make no choices. Everything is decided for them. It is hard for them to learn to make choices for themselves and plan for the future because it was never an option for them. We have found that the ones who were in the orphanages the longest have struggled the most with this. So, would you say that knowing we are unconditionally loved is the key to learning to walk in honesty and vulnerability, as well as true freedom? Without a doubt. I knew I loved them but until they came to know it, they were still functioning like orphans in many ways. Even today, many years later, it is still a struggle for many of them to be confident of my love and experience the freedom that should come from that. I think it is human nature to doubt love, especially if we have been hurt in the past by those who should love us. Let’s get back to your story. Tell me how you and Susan came to adopt six more children. After adopting the first two, our adopted daughter Anya would cry because she missed her best friend, Katya. We had met her in the orphanage and found out she had some serious hearing issues that required surgery. We brought her to the US to see Anya and to have the surgery performed. During that time we felt the Lord leading us to adopt her. When we returned to Russia to complete the adoption, we were introduced to her two brothers, much to our surprise. We ended up adopting them, too! One year after adopting Katya and her brothers, our son Alex began to pray for his three sisters who were still in Russia but had not been given up for adoption by the parents. We received a call from a friend informing us that the father had died, the mom had disappeared, and the girls were now in an orphanage. We again felt God’s leading to unite the family and adopt the girls. The family on vacation shortly after the last round of adoptions. Your adopted children quickly became Christians upon becoming part of your family. 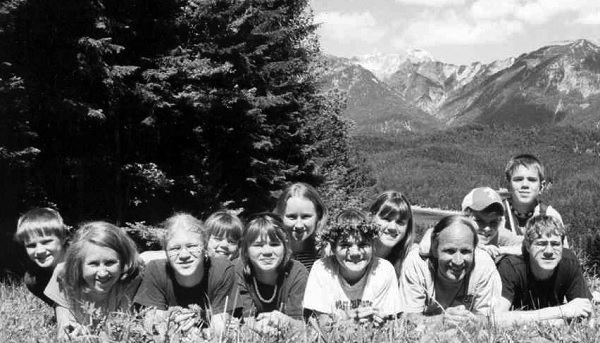 What do you think it was about the experience of being adopted that helped them quickly understand God’s love for them? I hope they saw unconditional love in us and knew that came only from God. We often tried to communicate that God had always been with them, even as orphans, and that He had seen their pain and loneliness and rescued them. Since they were well aware of what it meant to be adopted by a family, they could more easily see what it meant to be adopted by God. When I think of the time I have been able to spend with your family, I clearly remember feeling the love and presence of God abiding in your home. What are some practical things that you and your wife did to cultivate his love in your household? One of the most obvious truths about life is that you can only pour out what has been poured into you. You cannot draw water from a dry well. If we were not drawing from God’s love for us, we would have had no capacity to give it to our children. I confess I often felt like a dry well, but I knew the source of the water I needed. Because of this, Susan and I put a high priority on taking our personal time with the Lord. We also put a high priority on our relationship and getting time just for the two of us. Seeing God enable our marriage to thrive in spite of all the difficulties and stresses of life was probably the biggest evidence we could give to our kids of the reality of God’s love. The Lord has used your family’s story to inspire many others. Tell us about some of the ripple effects of your decision to adopt. Thankfully, the Lord has led a number of our friends to adopt, and many children’s lives have been radically changed. I am most thankful, though, for the ripple effects that I will never see—that future generations will know their heavenly Father because a handful of kids were adopted into Christian homes and taught of God’s love. That ripple effect could be huge! Your wife co-authors a blog for foster and adoptive parents that I subscribe to and am quite fond of, even though I’m single and without children. I would love for others to have that resource available to them and know a little bit of the story behind how it came about. Beth Templeton, a friend who also adopted from Russia, and Susan began to attend Christian adoption conferences around the country. It became clear to them that lots of emphasis was being placed on motivating the Church to adopt and even helping people with the process, but little was being done to encourage and equip parents after the adoption was completed. The difficulties are numerous and can be overwhelming, and it seemed little was being done to address most of these issues. So, Beth and Susan decided to create a blog called Hope at Home (www. hopeathomeblog.blogspot.com). They began to write about their experiences and lessons learned as mothers of adoptive children. The blog has had an impact on numerous families, and many regularly read it and are refreshed. As we move to close, are there any moments along your journey that exemplify our heavenly Father’s heart towards his children and the Spirit of Adoption? One of my fun memories is that one of our daughters always wanted to run away because “we weren’t her real parents.” So I told her she was free to run away, but I would go with her to protect her because I loved her. We spent more than one night out in the cold and in the rain running away together. It took years, but I think she began to understand that we loved her and that she could depend on us. On a much different note, not long after Alex was adopted, someone asked him if he wanted to keep speaking Russian. He responded, “No. My daddy does not speak Russian, so I don’t want to speak Russian. I want to be just like my daddy.” I am amazed that so early on he saw something in me that made him want to be just like me. I have often thought that I want the same attitude toward my heavenly Father. Last, I’d love it if you could elaborate a little more about how your journey as an adoptive father has impacted the way you know and relate with our heavenly Father. Being a father certainly makes me see how far short I fall of being the kind of father that God is! But that gives me an incredible appreciation for his grace. Only he can be the kind of father that my children need, and I am continually reminded that my job is to point my children to him. Also, being an adoptive father has taught me a great deal about the heart of adoption. I can honestly say that my love for my adoptive kids is no different than that for my biologic kids. I do not see them any differently. I want the best for all my kids and am willing to do whatever I think is best and necessary for their good. I know my heavenly Father looks at me the same way. His grace surrounds me at all times. My children did not choose me. I chose them. My children did not earn my love or my kindness. I have, to the best of my ability, lavished it on them. My heavenly Father has done exceedingly more than that for me. Sloan Milliken is learning to live as a son of his Father in heaven. He resides in Davidson, NC, where he owns a small house painting company and puts his English degree to use by writing killer estimates and doing some freelance editing on the side.